The Subtitles on Cyberflix TV is an inbuilt function of the app for Subtitles but sometimes it doesn’t work. There is a time when subtitles are not available for that particular movie/tv episode or it is just out of sync. Cyberflix TV app otherwise is a great app and it has a lot of great features that are worth experiencing. All you need a Cybeflix TV apk on android and just install it on your android device. Cyberflix TV automatically adds subtitles when you hit the ‘Play With Subtitles’ button but sometimes either the subtitles are not available or subtitles are out of synchronization. The voice and subtitle text don’t match and there is nothing more annoying than that. You may also need to add external subtitles on Cyberflix tv if you are not a native English speaker or just wanted to add subtitles in your Native local language. In either of the case, you do need to add external Subtitles on Cyberflix TV app. 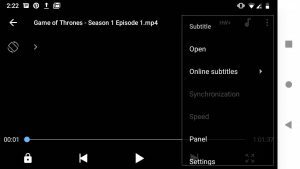 You can easily add subtitles on Cyberflix TV using MX Player or VLC Media Player. Here we are going to discuss the same. Streaming movies and tv shows using free apps expose you to Copyright Holders and Government Agencies. You may face legal proceedings for streaming Copyrighted Content for free. For your own protection from any copyright claims, we recommend you to use VPN for streaming movies. Using a IPVanish VPN, you can hide your IP from the network and defeat the Censorship by getting access to Geographically Restricted Content. Moreover, you will be able to use any free streaming apps anonymously without being tracked by any unwanted party. Get IPVanish VPN here and protect yourself from any unwanted legal notices and legal penalties for streaming copyrighted content. Cyberflix TV asks you to Install their own video player called CyberPlay Video Player. That player is very basic video player and doesn’t have features like MX Player. There is no option to add external Subtitles on Cyberflix TV using Cyberplay Video Player. That is why we recommend you to either use MX Player or use VLC Media Player. Both are the best Video Player for Playing/Streaming Videos online. Here is a quick and brief step to use MX Player with Cyberflix TV. 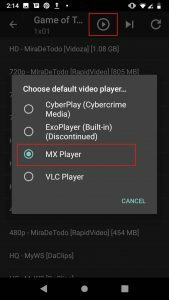 There are different ways to use MX Player and I will add all the possible ways of how to use Cyberflix TV using MX Player. 1. First and most preferred way is to set MX Player as your Default Video Player. For that, go to Cyberflix TV Settings by clicking on Hamburger Menu at Top-Left corner. Then Tap on ‘Choose Default Video Player‘ option and select MX Player. If you want VLC Media Player to be preferred Video Player tap on VLC Media Player. Make sure MX Player is already installed on your Android device. You can download MX Player from Play Store. 2. The second way is by Clicking on ‘Play’ option on top corner. See Screenshot. 3. Third and last way is to select ‘Play With‘ option. For that, tap and hold on the link you want to stream. On selecting that option, you will see the List of installed Video Player on your Android. Select MX Player on that. This way you can use Cyberflix TV app with MX Player or VLC Media Player. Now you can add external subtitles on Cyberflix TV using MX Player or VLC Media Player. 1. To add subtitle of Cyberflix TV on MX Player, you first need to Play the movie/tv episode. 2. Now tap on 3 dot menu at Top-Right corner and Go to Subtitle. 3. On that menu, there are two options viz ‘Open’ and ‘Online Subtitles’. If you already have a Subtitle.srt file downloaded in your local storage, you can select ‘Open’ and fetch .srt file. You can easily download Subtitles from the internet. Else move to step #4. 4. If you don’t have subtitle file downloaded, you can select Online Subtitles > Search. On selecting Search, MX Player will fetch for the Subtitles online. If you see No Results, it is advised to enter text to fetch Subtitles. Tap on the preferred Subtitles and it is done. That way you can add external subtitles on Cyberflix TV using MX Player. If any subtitle is out of Sync, you can fix it using MX Player. There is an inbuilt Synchronization button in the MX Player. In the same way, you can use Cyberflix TV on Firestick and add subtitles on firestick using MX Player. If you are using VLC Media Player with Cyberflix TV, well you can add subitles on Cyberflix TV but you don’t have much control over the Subtitles. There is an option to ‘Download Subtitles’ where VLC Media Player search for Subtitles on its own. You cannot search for particular keyword like we do in MX Player. Like MX Player, you can still add Subtitle.srt file which is already downloaded on your android device. You can see Screenshot below to get an idea. VLC Media Player on Android doesn’t provide you many options for Subtitles. You can use VLC Media Player if you have .srt file for subtitles. For online subtitles, you should see MX Player which provides you more options to add, modify subtitles. 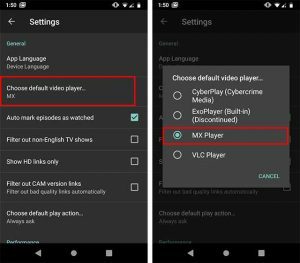 MX Player and VLC Media Player provide inbuilt options but if due to any reason, you don’t get the desired results, you can use Cyberflix TV inbuilt option for subtitles. For that, select ‘Play With Subtitle‘ option and Cyberflix TV will search the Subtitles from Opensubtitles.org. You will see the available Subtitles for that particular movie/tv episode. 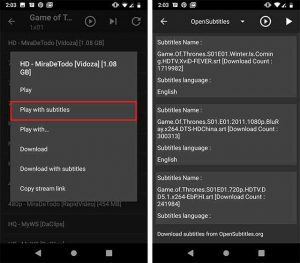 You can also switch between the Subtitle provider services from Opensubtitles.org to SubHD or Subscene from the option at the top. See the screenshots below to see how you can add subtitles using Cyberflix TV app inbuilt feature. That way you can use Cyberflix TV app inbuilt features to add external subtitles on the videos. This is a pretty reliable way to add subtitles on Cyberflix TV. Cyberflix TV app is a great app and it gets even better when used with MX Player. MX Player in itself is a great video player. It has a lot of great features that make the Cyberflix TV experience even better. 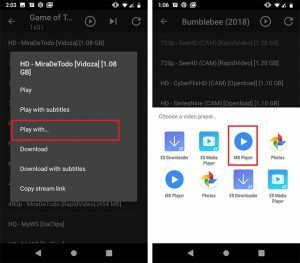 If you want to add subtitles on Cyberflix TV using MX Player, simply follow the above-mentioned steps and you will get the subtitles on Cyberflix TV. VLC Media Player, on the other hand, is a decent video player. VLC Media Player for Windows PC is a great video player but for Android devices, MX Player is the best video player. As compared to MX Player, VLC media player don’t have many options for the subtitle. So, now you can easily add subtitles on Cyberflix TV using MX Player as well as on VLC Media Player. If you have any query or suggestion, feel free to contact us.